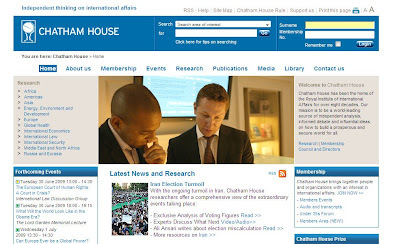 Chatham House - home to the famous Chatham House rule [you can use the material outside the room but who said it remains in the room] was founded in 1920, with a mission "to be a world-leading source of independent analysis, informed debate and influential ideas on how to build a prosperous and secure world for all." They have a number of research divisions, including those dedicated to international law, economics, and global health. It has introduced audio and video to a number of their public sessions. In addition to a report on UK cyber security, they have new pieces on what they describe as the Iran Election Turmoil , including a paper looking at the election figures. They also held an hour long briefing to journalists on June 17th, 2009. This is available as a video on the site, here. Alas, no embed. Note: This briefing was exclusive to journalists - but is now open to all courtesy of the web. 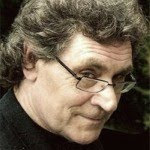 Interesting move and one that needs applauded!